ORIGINAL STORY: Well DAMN. Hip-hop king Kendrick Lamar has done it, taking out triple J’s Hottest 100 of 2017 with his gangsta rap-dismantling anthem, ‘HUMBLE’. As the internet’s foremost stat-crunchers rightfully predicted, Kung Fu Kenny nabbed the number 1 spot in today’s big countdown with his highly J-rotated single, narrowly beating out Aussie faves Gang Of Youths, who bagged a silver medal on the hottest hundo podium with ‘Let Me Down Easy’ as well as taking #41 with their Like A Version cover of Middle East’s ‘Blood’, #5 with ‘The Deepest Sighs, The Frankest Shadows’ and ‘What Can I Do If The Fire Goes Out?’ at #10. The rest of the top 10 songs Australia voted as the most fire of 2017 included Lorde’s ‘Greenlight’ at #6, Methyl Ethel’s ‘Ubu’ at #4 and Vance Joy at #9. Awesomely, this year’s Hottest hundo was 65% homegrown, with 65 of the tunes to get a guernsey on the Big List performed by Aussie artists, including 6 out of the top 10. 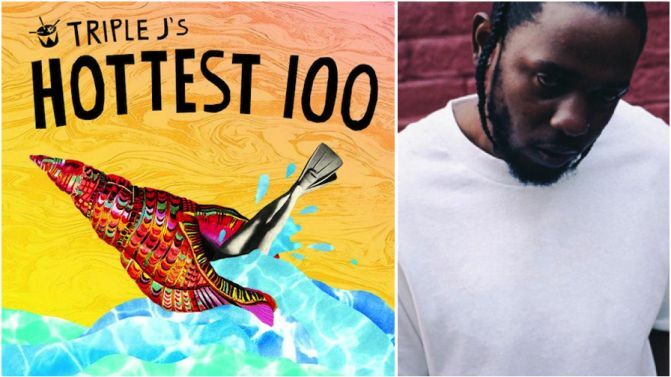 26 artists also popped their Hottest 100 cherries this year, including UK jokester grimelord Big Shaq with ‘Man’s Not Hot’. ICYMI: Today marked the first time in yonkers that JJJ’s Hottest 100 didn’t take place on Australia Day, after triple j decided to move the countdown away from 26th January. The Hottest 200 will follow tomorrow — Sunday, 28th January — when Double J will also be replaying the 1997 Hottest 100 (i.e. the most popular Hottest 100 of all time). Stay tuned to Music Feeds for live updates, and catch the full Hottest 100 of 2017 list, in all of its flaming glory, below. 10. Gang Of Youths – What Can I Do If The Fire Goes Out? 34. Kendrick Lamar – DNA. 79. San Cisco – Hey, Did I Do You Wrong? Rhianna has featured twice on the chart, first on Kendrick Lamar’s LOYALTY. at #97 and then on Lemon at #66 with N.E.R.D.